Home ♦ Build ♦ This Is The BRZ/FRS Turbo Kit You Have Been Waiting For! Crawford Performance is releasing a low-cost turbo kit for the BRZ, FRS, GT86 that will sell for $4,400 later this week! This is huge news because Crawford makes some of the best(well the best by far, in my opinion) turbo kits for Subaru’s and his current BRZ/FRS setup(The Plus 300 kit) makes 500hp/550tq on E85. But it also lists for $7,995 and has a bunch of add on’s that take the price even higher. But for you guys that want a bit more power, well actually quite a bit more power, their Plus 100 turbo kit for a stock BRZ/ FRS/ GT86 engine is the way to go. This is the development kit on the dyno for testing, so expect the final product to look awesome like Crawford’s other parts. 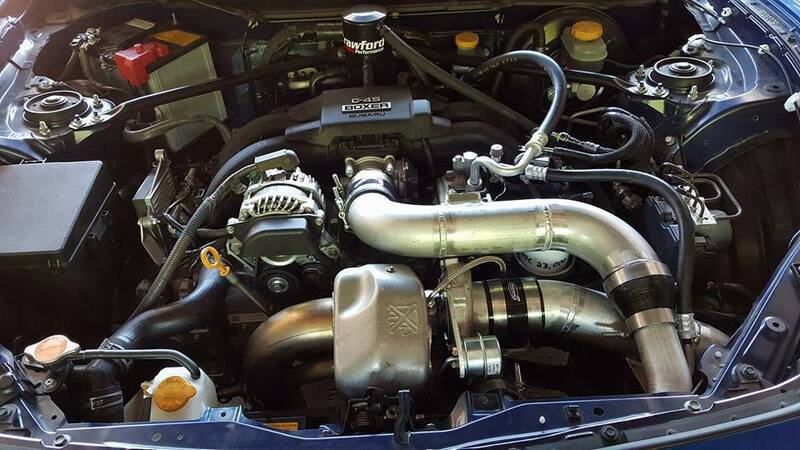 This new turbo kit runs on a stock engine internals with a stock fuel system and includes the software tune from Crawford at no extra charge. They are still in the process of final development but the results are looking pretty good and should make the stock BRZ/FRS come alive. 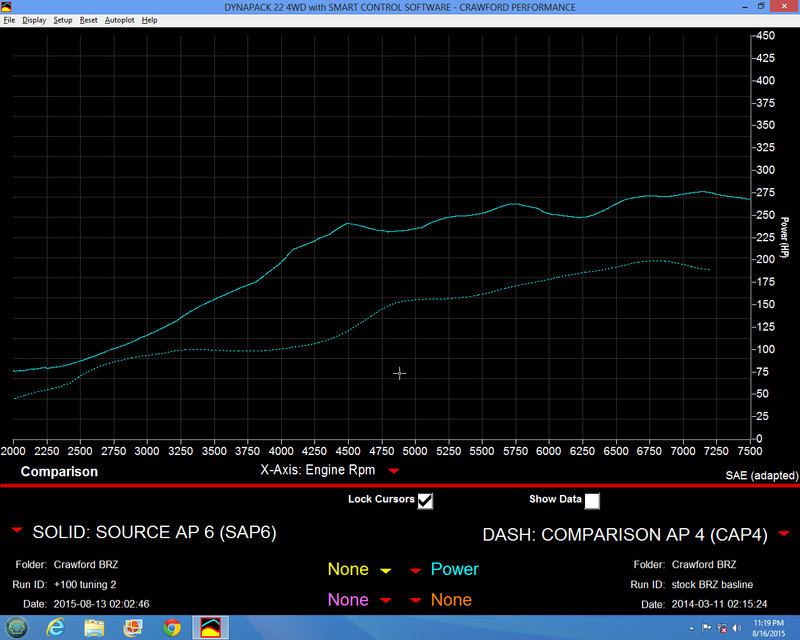 These dyno graphs show the engine’s horsepower and torque on 91 octane gas while it was 83 degrees in the shop. 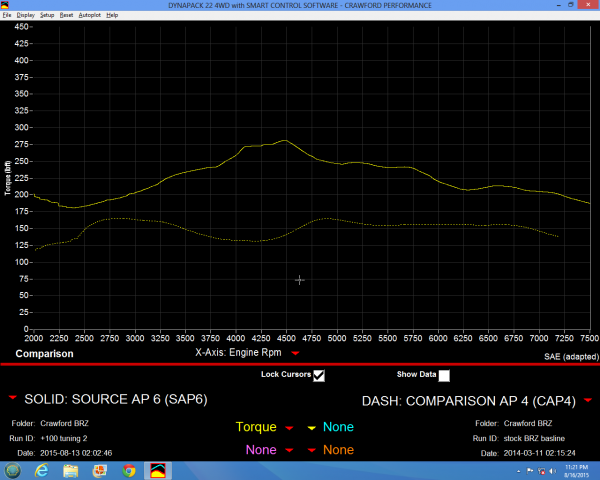 The dotted line is the stock baseline and the solid line is with the low-cost turbo kit. Keep in mind that the car was running a generic aftermarket exhaust from the stock overpipe all the way back and the power still looks great. My guess is that it would make even more with a free flowing overpipe and exhaust. I also heard the stock exhaust only robs around 15hp and keeps the car really quiet if you want to go that route. And with the stock exhaust, all you can hear is the turbo…which is pretty awesome sounding. Even cooler is that you can upgrade to the faster, more powerful Plus 300 kit by swapping in a Crawford built engine, a new fuel system, and other parts from the Plus 300 kit. Smart huh? I think so. 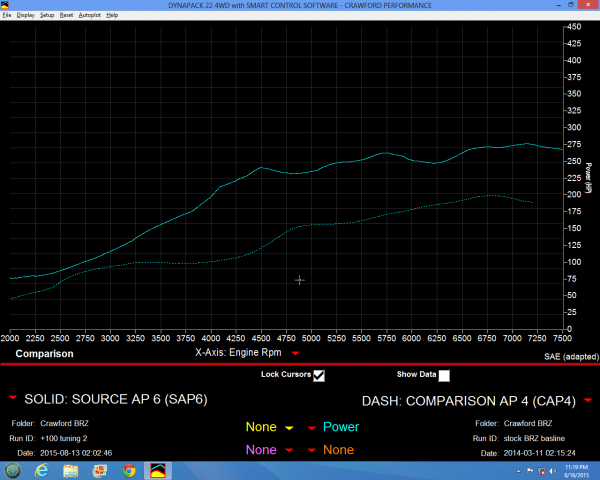 Benefit now from some turbo boost on your BRZ/ FRS and upgrade later when you need more power. If you’ve never heard of Crawford Performance, you’re missing out. They are privately held company based out of San Diego, CA that designs and manufacture extremely high quality performance components for race cars and the street. The key to their success is the engineering that goes into the design making their products the nicest and most effective on the market. For more information about Crawford Performance or their new Plus 100 turbo kit which should be for sale later this week, check out their website, call 760-631-2927 or contact us them through email.